OUR esteemed old Riverton friend John Mclnerney confirms what Mr. Herb. Gray suggested about the origin of sheaf-tossing. 'Yes, it was my late brother Jim who first suggested a prize for sheaf-tossing at the Tarlee picnic more than 50 years ago. The method was to place a bar about as high as a load of hay, and competitors had to pitch the sheaf over this; the distance it went after was the deciding factor, As Mr. Gray stated, the sheaves were just as they came off the binder, and didn't stand very many throws. However, a plentiful supply was on hand and fresh ones were used. About 22 entries were received for the initial contest. 'Bowling at a single stump was also on the bill for the first time; and this is a popular event at picnic sports today. Another novelty was a polo race. Competitors lined up on hacks armed with a polo mallet, and had to thump a ball about 15 chains or so to the winning post. Swimming contests, too, were decided in a large pool close by in the Gilbert. 'For two or three years Phil Roberts ran here as a boy, but the committee insisted that he should in future run in the men's class. Mr. Joe Denton, of Farrells Plat, was another good sport, and Mr. Bevan. 'A splendid luncheon was provided by the ladies— turkey and ham in plenty—with a help-yourself supply of pickles. I believe that the luncheon for 1/ was an attraction in itself. 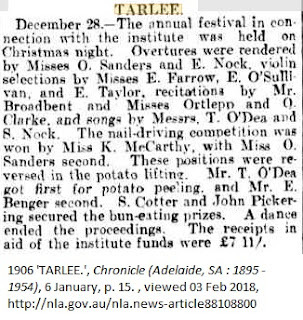 Setaro's Canary String Band supplied the music for the day and night, Really, in those days, the Tarlee picnic was spoken of as the Onkaparinga of the North. This article led me on more explorations. What was Setaro’s Canary String band and what was Duffield’s mill in Gawler? From May of 1889 advertisements for Signor Francesco Setaro’s band started to appear in newspapers. Hundreds of events from then on, referred to this popular band which provided music of a great variety from opera to popular tunes. Yearly socials of literary societies, church groups of various denominations, fetes, picnics, banquets and sports occasions were all enhanced with music provided by this band. Sometimes it was intermittent music between other recitals or dance music provided at the end of an evening function. The band name with canary added in came about as recognition of one of several popular pieces he composed - The Canary Waltz. This photo shows the mill in 1882. I then explored references to the Gawler Mill and found through Trove that as early as 1862 additions to the mill were being made to cater for the quantity of wheat being delivered there. Walter Duffield the owner of the Gawler and several other mills is profiled here in The Australian Dictionary of Biography. Trove a true treasure of stories of the past. The power of a book club. Three men wanted more books to read, others followed their lead. 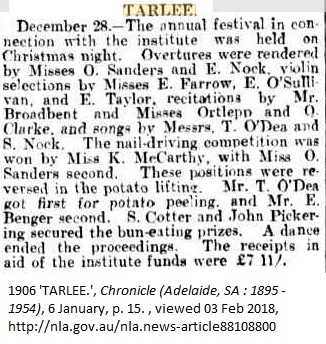 In 1888 in Tarlee, in the mid-north of South Australia, an institute was established and subscribers paid for the privilege of reading. Money was raised to erect a building to house books, provide reading and other public space. The Public Library Board offered affiliation and supplied books to local institutes as well as purchases being made by the local community. The Institute was used as a polling booth, a room was let to a bank, and a multitude of community functions were held. Each year the exhibits for the local show were housed in the building. 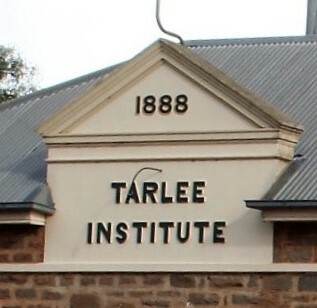 In 1905 the Tarlee institute incurred the displeasure of the Public Library Board by their disposal of 44 dilapidated volumes. (1) After this incident, regulations were changed to allow for more local decision making. Fundraising efforts towards completion of the building continued as exemplified by this short article where participants enjoyed several competitions. These included nail-driving and potato lifting for the women and potato peeling and bun-eating for the men. Thirty-five years ago three men - Messrs. P Hogan, Prescott, and G. Walker started a book-club in Tarlee. Others asked to be allowed to join, so an institute was formed. In 1888 portion of the commodious hall depicted in our illustration was built with the support of the Wooroora Agricultural Society, who gave a free grant of land. This year the building was completed, and a re-opening ceremony was performed by the Hon. J. J. Duncan. Great praise is due to the president (Mr. J. F. Godfrey). the vice-president (Mr. J. Mclnerney), the secretary (Mr. K. Noack), the treasurer (Mr. J, O. Taylor), and the committee (Messrs. J. Bond. I Jacobs, W. Pickering, M. McCarthv. E. Willis, R, H. Clarke, and F. Fleming) for the determined effort which was made first to reduce the debt on the old building, and then to raise money for the completion of the original design. The trustees are Messrs. McInerney (chairman), R. H. Clark,. J.G. Kelly, J. Bond, and J. F. Godfrey. The Institute Hall is used every year for the local show. Two years later the same paper published an article on the Institutes of the Lower North in which they compared the buildings and services offered by the institutes in six towns of the region. Throughout the years this humble building became the centre of a wide variety of activities for its community. In more recent years extra rooms and facilities have been added to the side of the building. A 1954 article in Trove captures the opening of the supper room built on to the side of the Institute. Meetings for local committees, fetes, dances, farewell socials, concerts, debates, family celebrations, CWA meetings, election campaigns, polling booth: these are just a few of the types of functions held in the Institute which sprung from the humble beginnings of a book club.